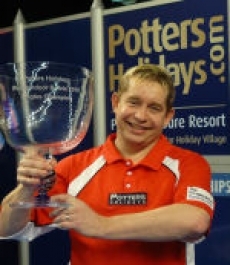 Henselite UK sponsored Greg Harlow suffered his second final defeat of the 2011/12 World Bowls Tour campaign when he lost in straight sets (10-1, 8-4) to Scotland's David Gourlay in the final of the Welsh Grand Prix at Llanelli. So disappointed was Harlow with his display in the final that he actually apologised to the large crowd at the Selwyn Samuel Stadium. Harlow's controlled aggression, combined with subtle drawing bowls when necessary, had paid handsome dividends during his semi-final victory over fellow Henselite UK sponsored player Paul Foster, but during the opening set in the final he struggled with his weight and direction, and within five ends Gourlay, was virtually home and dry with an 8-0 lead. He scrambled a few shots in the second set, but Gourlay always held the upperhand, and two perfectly drawn bowls on the eighth end when 6-4 ahead only served to emphasise the difference between the players on the day.